There’s everything to like about Gemma Monroe, the young, conflicted police-detective protagonist of Denver author Emily Littlejohn’s headed-for-the- stars mystery series published by Minotaur Books, the mystery imprint of St. Martin’s Press. 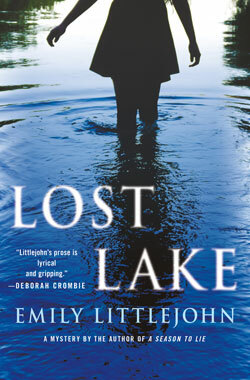 In Lost Lake, the third in Littlejohn’s series released this month, Monroe finds herself torn between investigating the brutal murder by asphyxiation of the director of the local history museum in the fictional Colorado ski town of Cedar Valley, and caring for her newborn baby along with her similarly hard-working boyfriend in the months following the baby’s arrival. The same qualities that imbue Monroe — stubbornness, a droll sense of humor, and an iron-willed work ethic — are found in Littlejohn herself, and speak to the reason Four Corners-area devotees of great writing and captivating mysteries should make a point of attending Littlejohn’s first visit to the region next month at Maria’s Bookshop in Durango. Littlejohn will appear at Maria’s on Thursday, Nov. 8, at 6:30 p.m. with Margaret Mizushima, another notable Front Range mystery writer also making her first visit to the region. Mizushima is the author of Burning Ridge, the fourth book in her top-selling Timber Creek K-9 Series, released last month by Crooked Lane Books. I will serve as moderator for the event, during which Littlejohn and Mizushima will discuss the pleasures and challenges of writing police-procedural mysteries set in Colorado mountain towns from their home bases in the Denver metropolitan area. As she did in the first two highly praised books in her series, Inherit the Bones and A Season to Lie, Littlejohn introduces in the opening chapters of Lost Lake a slew of quirky suspects connected by numerous threads. Some of those threads trail back more than a hundred years to the deaths by drowning of several teenage girls from Cedar Valley over the course of a single month in the eponymous lake of the book’s title. The early setup of the tale also includes a museum employee gone missing during a camping trip to Lost Lake, high in the mountains above Cedar Valley, at about the same time as the director’s murder; and the theft of a priceless, century-old mine owner’s diary, said to be cursed, that may shed light on the teenagers’ presumed suicides- by-drowning in the late 1800s, as well as on the present-day killing of the museum director. As she races to reveal and apprehend the murderer before more bodies pile up, Monroe rides a caustic mixture of stale snack food and greasy fast food from one suspect interview to the next, while catching only short snatches of sleep and even shorter, guilt-ridden snippets of awake time with her baby daughter. Like Monroe, Littlejohn is a young working mother whose sudden success with her series has resulted in unavoidable work-life stresses. Those stresses clearly find their way into the psyche of Monroe as the Cedar Valley Police Department detective works to solve the interlocking mysteries at the heart of Lost Lake, making the book satisfying both as a humanly emotional read and as a head-scratching whodunnit. Emily Littlejohn’s Lost Lake is not to be missed. The same goes for her appearance, in conversation with Margaret Mizushima, at Maria’s Bookshop in Durango on Nov. 8. Scott Graham is the National Outdoor Book Award-winning author of the National Park Mystery Series for Torrey House Press. The fourth book in the series, Yosemite Fall, was released in June. Visit Graham at scottfranklingraham.com. From October 2018, Prose and Cons.